As a lover of coffee, the place I go to get my fix here in Cheltenham, is a speciality coffee roaster called the Scandinavian Coffee Pod. They hand roast seasonal coffee beans in their unique coffee pod – a five metre square glass cube. Coming soon is their brand new coffee bar and roaster, which will be the first of it’s kind in Cheltenham. They take care to perfectly roast every bean to order. The concept is ‘Scandinavian by design and at heart’; learning from the long-kept coffee traditions from far flung Nordic countries. More coffee is consumed there than anywhere else on earth – to warm, sustain and rejuvenate.’ and they are right! Their coffees change every season to reflect the seasonal harvests. They hand roast all their beans to order, using a scientific method of temperature, time and air-flow, which is tailored to every bean variety to maximise its taste. Roasting with great care achieves the highest possible results. The same bean roasted just a few degrees differently can taste very different. How to taste and recognise flavours in coffee. Their beans are sourced from farms that are Rainforest Alliance Certified. Caring for the environment as much as the coffee. The beans are purchased and sourced from the finest farms at the best prices for the farmer who grows the coffee. My love for coffee has grown and its all thanks to Chris, who is the master roaster at the Pod, joined by James and rest of the team. 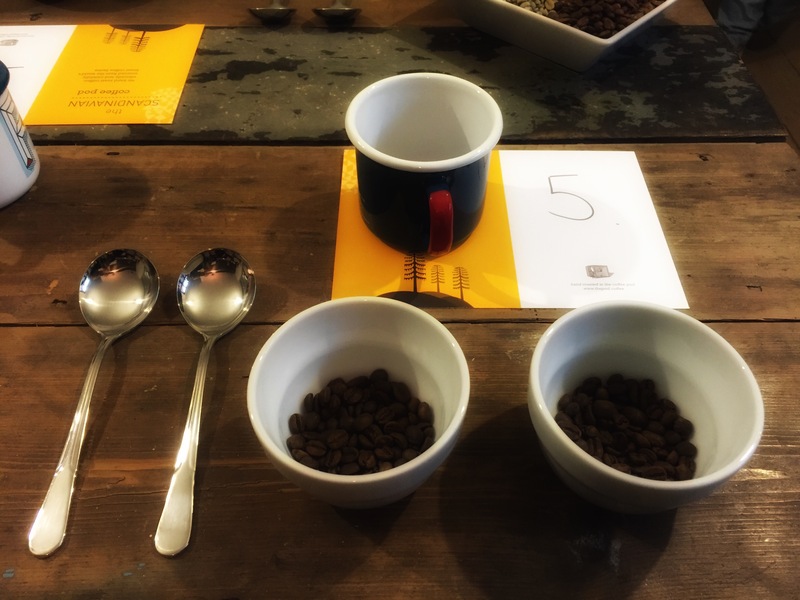 When I was invited again to their 2nd cupping event, I decided to share with you what a coffee cupping event entails. So what is coffee cupping? It’s a practice that all coffee professionals use to observe the taste and aromas of brewed coffee. The procedure involves using 14 1/2 grams of coffee in each bowl and the same amount of water so its like for like in each. We are then taught how to ‘break the crust’, deeply sniff the coffee, and then loudly slurping the coffee so it spreads to the back of the tongue. This allows the coffee taster to measure aspects of the coffee’s taste, such as the body, sweetness and acidity. It is explained how the farmers process the beans by either ‘washing’ or ‘naturally dried’. Washing is a process that washes away the fruit covering the seeds/beans before they are dried. This is normally achieved in 24 hours and has no sweetness. Coffee processed by this method is called ‘washed coffee’. The wet method requires the use of specific equipment and substantial quantities of water. Washed beans leads to a cleaner tasting and is less acidic. The dry process, also known as ‘unwashed or natural coffee’, is the oldest method of processing coffee. The entire cherry after harvest is cleaned first and then placed in the sun to dry for 4-5 weeks. These beans tend to be sweeter. 1st: Brazilian Londrina – This coffee is pulped naturally and grown 1160 metres above sea level. The flavours noticed are nutty coffee with hints of chocolate, toffee and hazelnut. We were advised that this is great with or without milk and is easy to brew. 2nd: African Rwanda – A washed bean; these are new to the Coffee Pod team. With hints of cocoa, plum and honey, but also savoury flavours like tomato. 3rd: Ethiopian Rocko Mountain – Naturally dried bean and grown at an altitude of 2150 metres. The flavours of this coffee are blueberries, jasmine and honeysuckle. 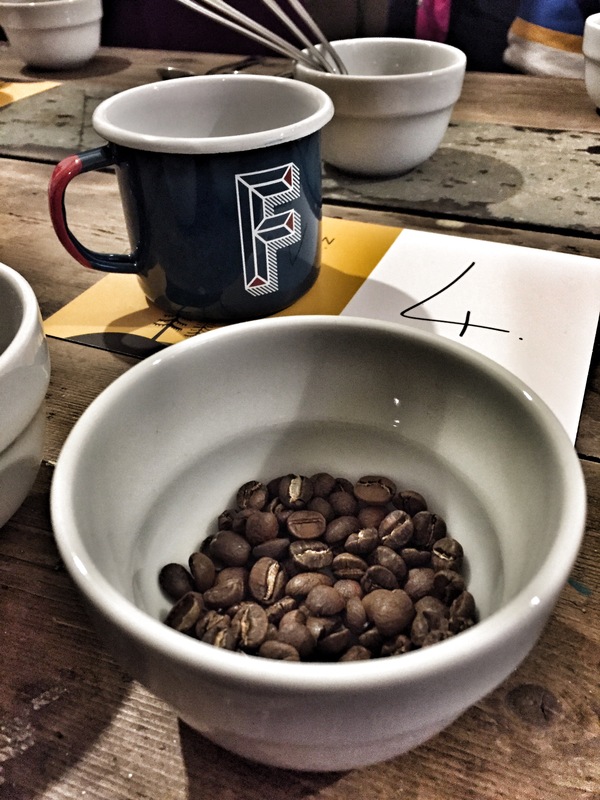 4th: Tanzania Tweega – Another new coffee for the Pod and it wasn’t enjoyed by most of the tasters. This coffee had a strange after-taste, but this is something the guys will develop. The tasting notes were black cherry and honey. In case you are wondering, Tweega means ‘giraffe’. It is believed that the long neck of a giraffe is representative of the never-ending search for the best quality coffee and the black tongue comes from drinking too much of it! 5th: Mexican Blend Las Delicias – This was the first time that this blend had been tried by Coffee Pod and is the only Central American coffee they use. This coffee was actually decaffeinated and very easy to drink. Naturally processed by mountain water grown 1000 metres above sea level, the notes consisted of honey, vanilla and nuts. I had such fun learning about coffee and getting tastes for fresh coffee again. I can’t wait for the opening of their new coffee bar and try some new roasting.